If you’re just getting starting, remember: “Tight is right!” Get the Texas Holdem equities vs. preflop ranges here. Adhere to strict bankroll management! Playing a big-stack strategy (BSS), i.e., buying in for the maximum of 100 big blinds per table, you’ll need around €2,500 in your bankroll. You can play a mid-stack (i.e. “hybrid”) strategy (MSS) at the same level with €1,000 in your bankroll, but not much less. With a small-stack strategy (SSS), i.e. buying in for 20 big blinds per table, you could play at NL100 with a total bankroll of only €500 (the minimum you should deposit at Poker Heaven in order to be able to receive the maximum sign-on bonus of €1,000). If you plan to play a BSS and only deposit €500, the maximum limit you should play is NL20 (i.e. buying in for €20 per table with blinds of €0.10/€0.20). A crucial aspect of your bankroll management plan is setting and always adhering to a “stop-loss” limit every time you play! Any time, in any session, that you lose 3 stacks or more … pull the plug immediately! That means, check the “sit out next big blind” button, see the rest of the hands that you’ve paid for with your blind posts for that orbit, leave all open tables and take a break for a full hour. Review the strategy section of this site a bit or the free downloads provided for members, or just relax and then start another new session later in the day. This “loss-limit” will save you hundreds of Euros in the long run. Table selection is everything! Actively hunt for loose/passive tables and avoid tight/aggressive tables. Sort your online poker table display list by stakes (don’t play above your means!) and then by “players per flop” or “table VP$IP” (voluntarily put money in the pot) and the like. “Join the table/waiting list” from the top down with the exception of tables with larger pot sizes at slightly lower VP$IP levels, since these are the ones where you’re more likely to get paid off big with your speculative hands that turn into flopped monsters. On most poker sites, the players/flop figure is the primary indicator, which tells you how “loose” or “tight” the table is in general. Always be mindful of how looseness and passivity change at your table(s) during any given session; if players start to tighten up and get more aggressive or if the fish-to-shark ratio decreases, get up and find a better table. Also look for a better table if you notice that players to your left are consistently out-playing you post-flop (e.g. where you raise or call pre-flop, get re-raised and then end up folding quite a bit on post-flop streets). Play at full-ring tables with an average standard TAG (tight-aggressive) style of around 10%–15% VP$IP (voluntarily put money in the pot = passively entering the hand with a limp or call) and 10% PFR (preflop raise frequency). Apply strong in-position aggression, and definitely change up your play from time to time if you’re facing “regulars.” However, at the low/middle stakes (anything under NL200), it’s best to just sell it when you’ve got it! Once you have some success with this style, we’ll introduce you to the LAG approach, which is especially crucial for optimal 6-max and shorter-handed play. When multi-tabling at the beginning of your online poker career, do not play more than four tables at a time. Playing “in position” is crucial for your long-term win-rate. If you’re able to choose your seat, as Mike Caro — the godfather of the science of detecting and reading poker tells — advises, “sit behind [i.e. to the left of] the money, have loose/aggressive players to your right and tight/passive players to your left.” Play fewer hands in early and middle position pre-flop (especially at full-ring poker tables) without “high-end” hands: e.g., in Texas Hold ’em, the top 3.3% of all hands are JJ+ or AQs or AK and the ~top 6.5% would be 88+, ATs+, AQo+. Focus on getting involved in more pots when you’re in late position, occasionally raising also with speculative hands to “steal the button” and/or isolate limpers. As often as possible, you want to be the last to act on all post-flop streets. In order to reduce your VP$IP in early and middle position, a good trick is only to play your Broadway (i.e. TJ+) and A8+ hands when they are suited … not because suited hands are much better (suited only adds 3% to 4% equity to your hand on average) but because you’re 75% more like to be off-suited than suited. If you’re on passive tables, i.e. your opponents rarely raise preflop limpers or 3-bet open raisers, there is no shame in limping or only flat/cold-calling with speculative hands listed in the following point in order to see what flops. If you hit big (i.e. 2 pair or better or a monster draw with 12 outs or more), you play on and if not … you wait for a better wave. Be very cautious and generally play for pot-control (as opposed to pot building) when you “only” flop top pair or an over pair … especially on “wet boards” (i.e. 2- or 3-suited and closely connected in rank) with multiple players still involved in the hand. For most players, we would generally advise over-limping with suited no-gap or 1-gap connectors and suited Ax hands or over-calling an open raise with small/medium pairs (22-99) only when there are a few cold-callers before your action. You will flop a set or better with your pocket pair 1 time in 8.5 flops, so you need to be able to pick up around 10 times the amount of your preflop call in the long run. When over-cold calling, most players should usually play “fit or fold” on the flop (i.e., top pair+ or big draws) and usually bet if it is checked around to them when they’re in position, irrespective of what they flop. Always be mindful of your opponents’ flop check/raise stat. Especially when you flop a decent draw, it’s often a good idea to semi-bluff bet or raise when last to act and then take the free card if it’s check to you on the turn and you haven’t completed. Again, be very careful if you only have top pair in limped pots or where the pre-flop open raiser was in early position: you’ll often be facing 2-pair or better or an over-pair if you encounter serious resistance. When you do bet or raise, pre-flop or post-flop, always wait the same amount of time before hitting the bet/raise button, and almost always raise the same amount … with AA and also with 54s! Take advantage of all the free advanced poker-strategy articles and blogs and especially watch the Essential Poker Knowledge videos while moving up the limits. Note that the hand/position-specific recommendations above are very generalized for your cash-game play at Texas Hold ’em full-ring tables. You’ll find all the details for Omaha, 7-stud and 5-card draw/stud cash games and tournaments in the poker-strategy section . If you plan to play more seriously, click here to get all the other poker-analysis tools, key stats, and calculators that we use for all our Texas Hold ’em, Omaha, 7-Card Stud and 5-Card poker sessions, both online and live. 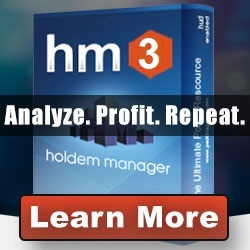 For you future online grinders, be sure to also check out the following poker-tracking software, which I use myself every time I play online cash games, MTTs and sit-and-go tournaments.